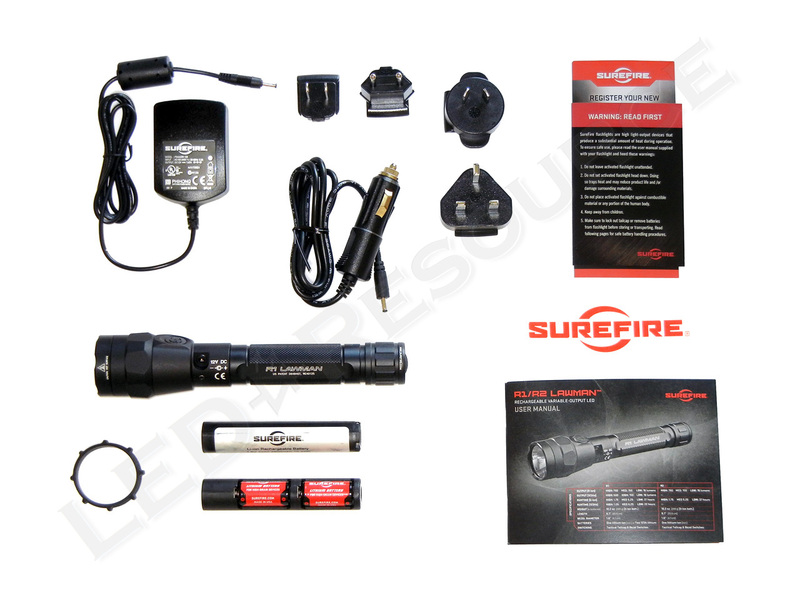 Designed specifically for law enforcement duty, the compact SureFire R1 Lawman is the first of SureFire’s rechargeable LED lights to be released and includes a new high-output LED, high capacity lithium-ion battery for increased runtime, and user-programmable head and tail switches. Maximum output for the R1 Lawman is an impressive 750 lumens and optional medium and low modes provide up to 37 hours of runtime. 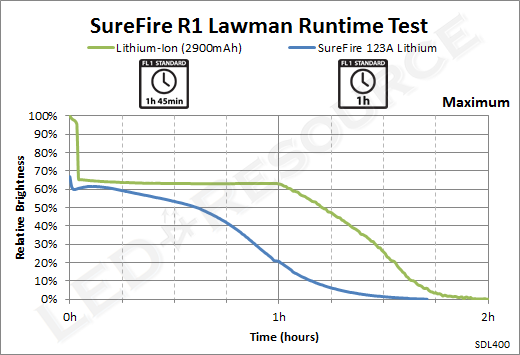 Find out more about this performance-packed rechargeable duty flashlight in our exclusive review of the new SureFire R1 Lawman! Weight with Batteries: 10.2 oz. MSRP for the R1 Lawman is $455, and the light is only available in black. 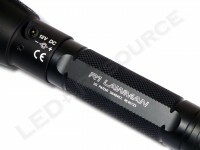 Several retailers already have the R1 Lawman in stock, and actual pricing is estimated to be around $350. 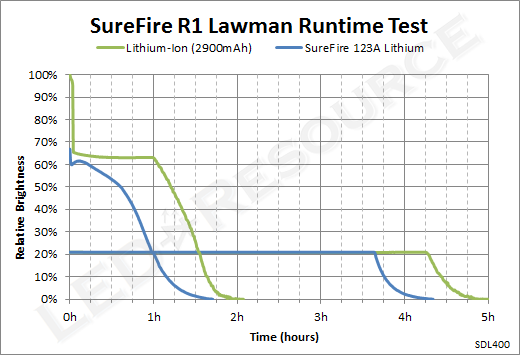 We received our R1 Lawman in pre-production packaging, but production models will come in a cardboard box with similar contents, including: SureFire R1 Lawman, Lithium-Ion rechargeable battery pack, “Dual Fuel” battery carrier with 2 x SF123A batteries installed, AC adapter with international adapters, 12V car charger, rubber anti-roll ring, and user manual. 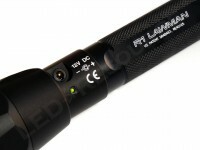 One of the many improvements that the R1 Lawman received during its development was a new, higher-capacity, battery pack. With Panasonic’s Nickel-Oxide New Platform (NNP) technology, the proprietary rechargeable lithium-ion battery pack has an increased capacity of 2900mAh and is rated for 500 full discharge cycles with a 20% loss in capacity (up to 2000 cycles with partial discharge cycles). To charge the light, connect the AC adapter to the charge port on the light. When the Fuel Gauge LED turns green, the battery is charged to 90% capacity. Typical charge time until 90% is two hours, and it will take an additional two hours to reach 100% capacity. For maximum battery longevity, as mentioned above with the cycle count, you may want to consider only charging the battery to 90%. While rechargeable systems are cost-effective and convenient, most can only be powered by the rechargeable battery pack, leaving you in the dark if the rechargeable battery is depleted. 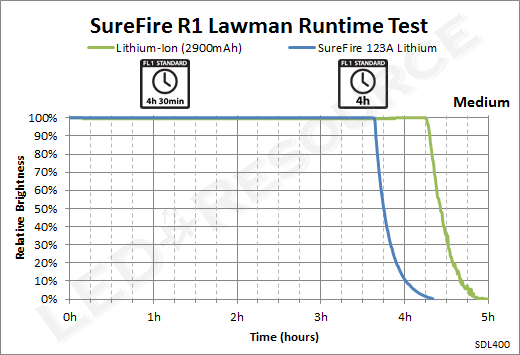 With “Dual Fuel” capability, the R1 Lawman stands among the few rechargeable flashlights that can also use regular disposable batteries – in this case, 2 x 123A lithium primaries (rechargeable lithium-phosphate batteries are not supported). If the battery type is changed, or depleted primaries are replaced with new ones, the Fuel Gauge requires a reset by briefly pressing the tail switch. 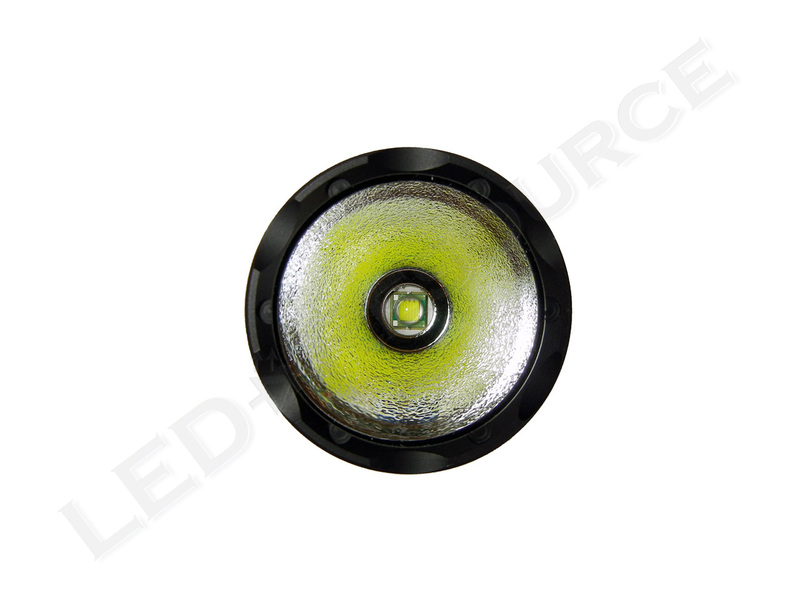 Behind the crenelated bezel are an anti-reflective coated glass window and a textured reflector. Flat areas on the head stop the light from rolling away on a smooth surface. 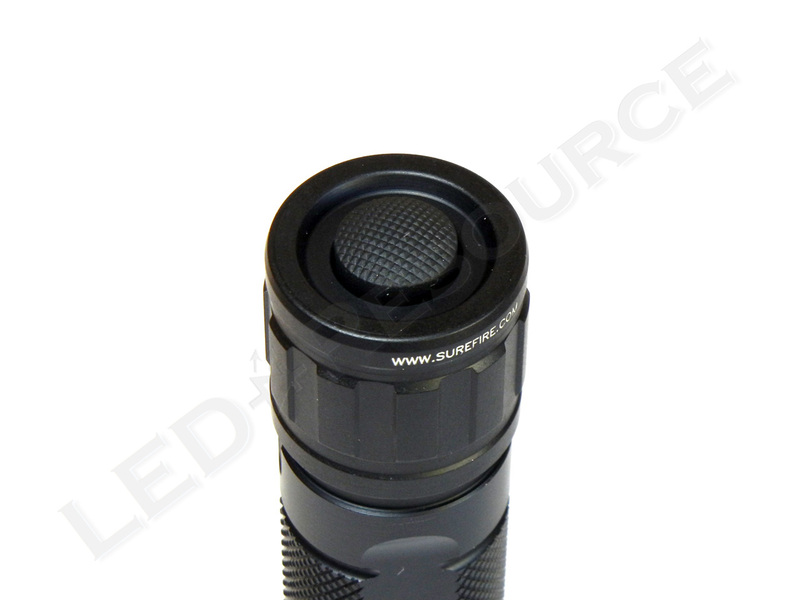 Raised texturing of the SureFire logo on the rubber cover gives tactile feedback for the electronic head switch. 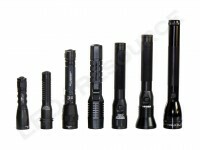 The body is type-III anodized to resist scratches and corrosion, and aggressive knurling along the body of the light provides grip. Next to the water-resistant charge port is the Fuel Gauge LED, which indicates battery charge status during use and while charging. Green indicates at least 90% charge, orange indicates reduced battery charge, red indicates low battery, and blinking red indicates that it’s time to charge or replace the batteries. On the tail cap is a tactical “press for momentary, twist for constant on” switch. To prevent accidental activation in a tactical situation, the tail switch has a raised border and requires more pressure to activate than a regular clicky or electronic switch. 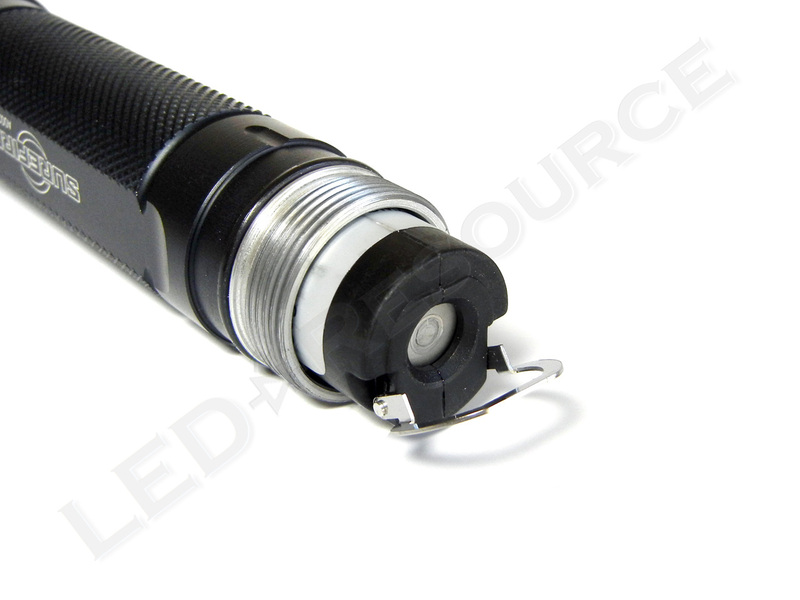 To activate the lockout tailcap feature, unscrew the tail cap until the light no longer turns on (about a half-turn). The light can still be activated by the head switch if the tailcap is locked out. Four modes, which are arranged into three function sets, are available for the user to choose from. If multi-mode operation is selected, the head switch will activate the previously used mode. 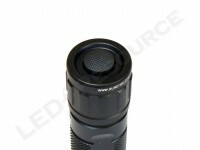 100% mode for 750 lumens. Always accessible from the tail switch, independent of the head switch. 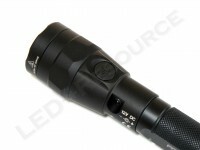 20% mode for 150 lumens. 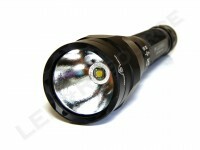 2% mode for 15 lumens. 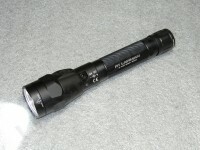 With three consecutive presses or twists, the 750 lumen strobe is activated. To change the function set, twist the tail cap for constant on and hold the head switch until the light turns off. Unscrew the tail cap, and the R1 is now in the next program set. When using program 1 or 2, we found a good balance of output and runtime if medium output is programmed in memory for the head switch since maximum output is always accessible from the tail switch should it be needed. Using the same high-performance Cree XM-L LED found in the P2X Fury, the R1 Lawman raises the bar once again with its maximum output of 750 lumens, equivalent of a typical 60W incandescent bulb. 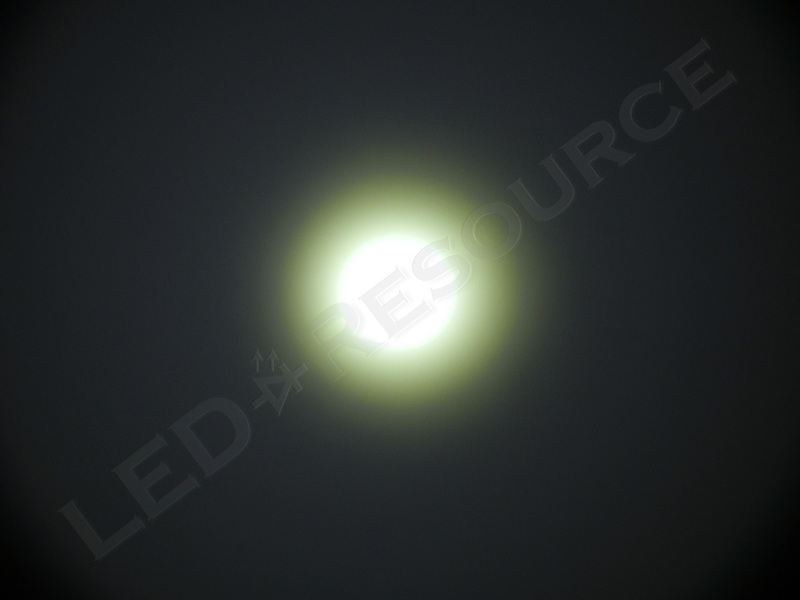 This combination of a large-die LED with a textured reflector produces a smooth, flawless beam that will light up just about anything. 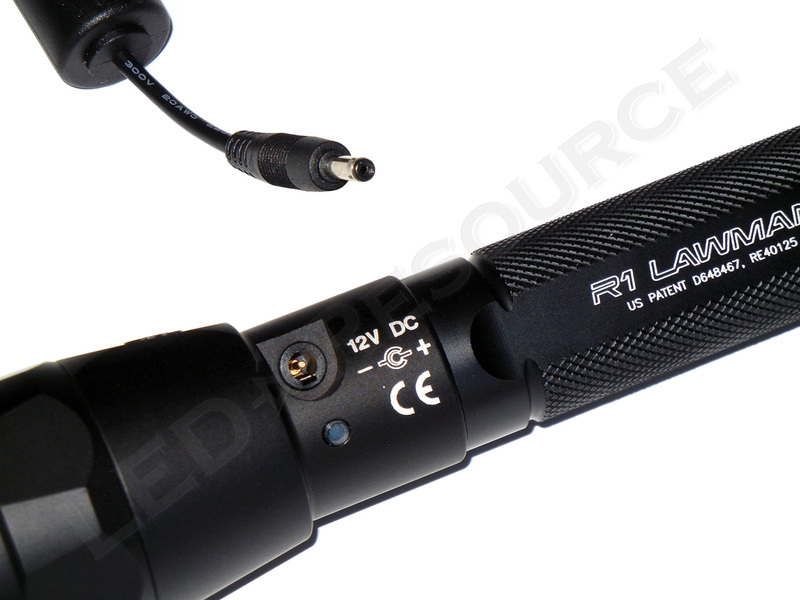 Due to the electronic head switch and memory feature, the R1 Lawman has a standby drain of 200 µA (or 0.2 mA). Even though this is a fairly significant standby drain compared to other lights, it will take 1.6 years to drain the 2900mAh battery, so we don’t expect it to be an issue. 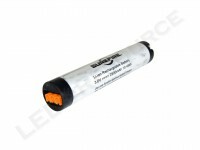 For long-term storage, it is recommended to remove the battery pack. SureFire uses tactical and total runtime, which are not necessarily consistent with ANSI FL-1 Standard specifications. 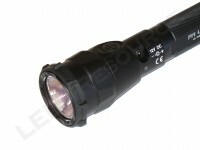 For the R1, maximum output runtime is given as tactical runtime (50 lumens = 7%), and lower output runtimes are given as total runtime until battery exhaustion. 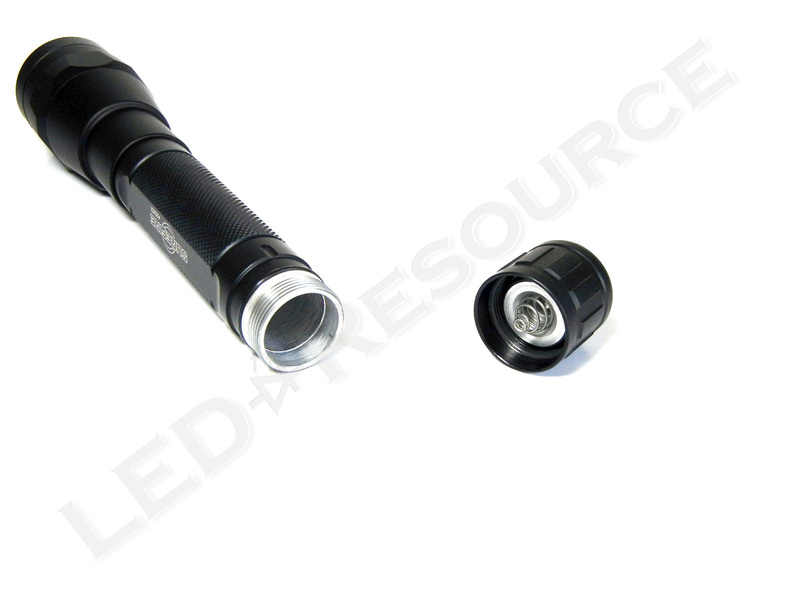 When using the rechargeable battery, the R1 reduces output to 500 lumens after a 2-minute burst of 750 lumens. Due to non-linear brightness perception, the reduction during actual use is not as noticeable as the numbers seem to imply. Almost everything that you may need is included with the R1, including a variety of charging and battery options. One unexpected item was the anti-roll ring, which gives the R1 even more stopping power when set down on a smooth surface. 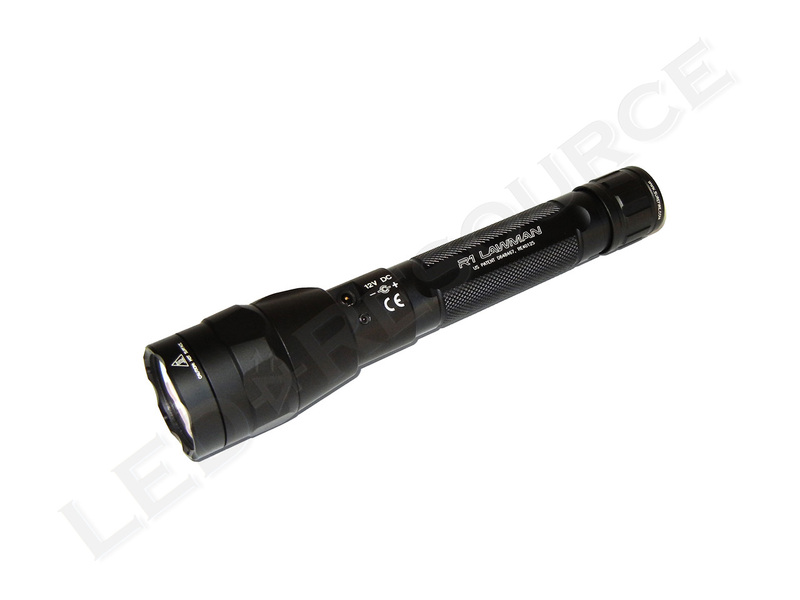 Whether the intended use for your flashlight is tactical or not, the SureFire R1 Lawman is guaranteed to perform in any situation where an illumination tool is indispensable. SureFire has taken a while to get the R1 Lawman just right, having gone from the original 300-lumen prototype announced at the 2011 SHOT Show, to the 700-lumen model with a one-hour runtime shown at the 2012 SHOT Show, and finally settling on a 750-lumen model with a 1.75 hour runtime for production. 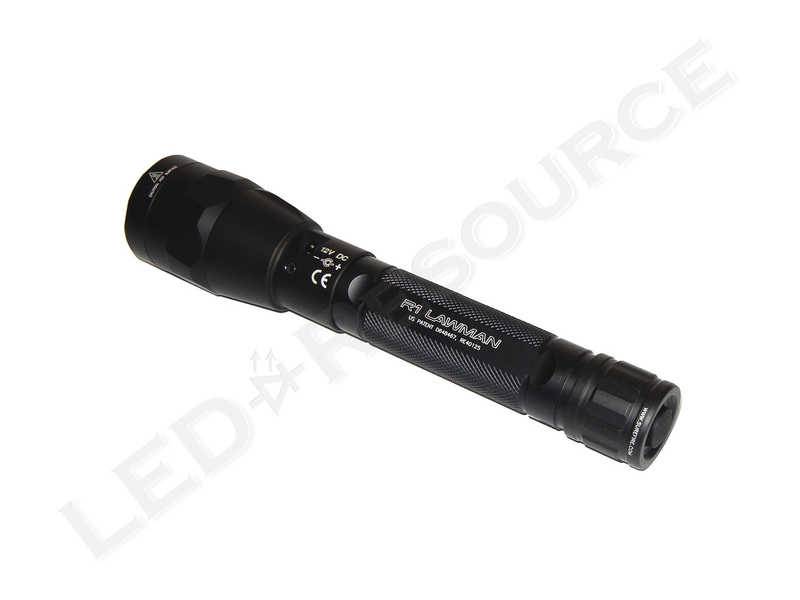 By combining multi-mode operation with memory and a medium output of 150 lumens, the R1 Lawman is not just extremely bright, but also convenient and practical for many uses where runtime may be preferred over output. One aspect about the R1 Lawman is still lingering, and you might have guessed it already – price. 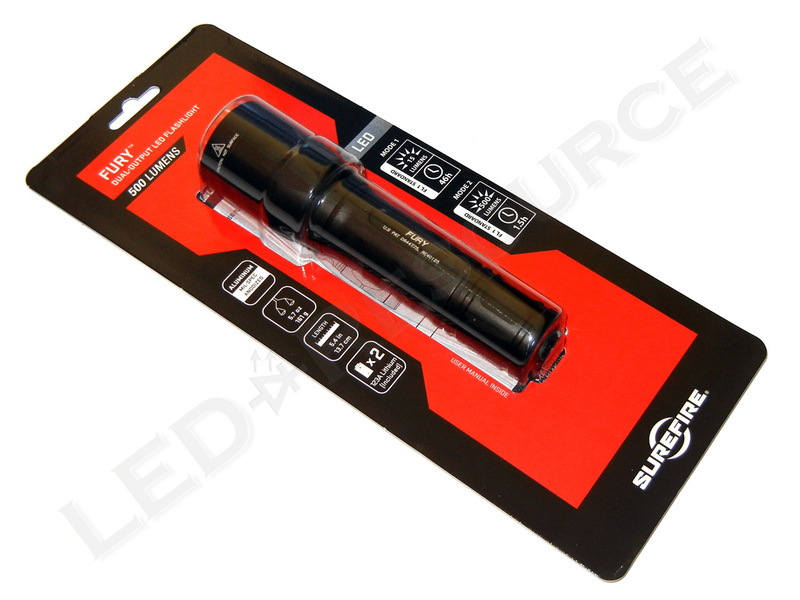 It shouldn’t surprise those who are familiar with SureFire products, but the price is indeed quite steep compared to other rechargeable lights. 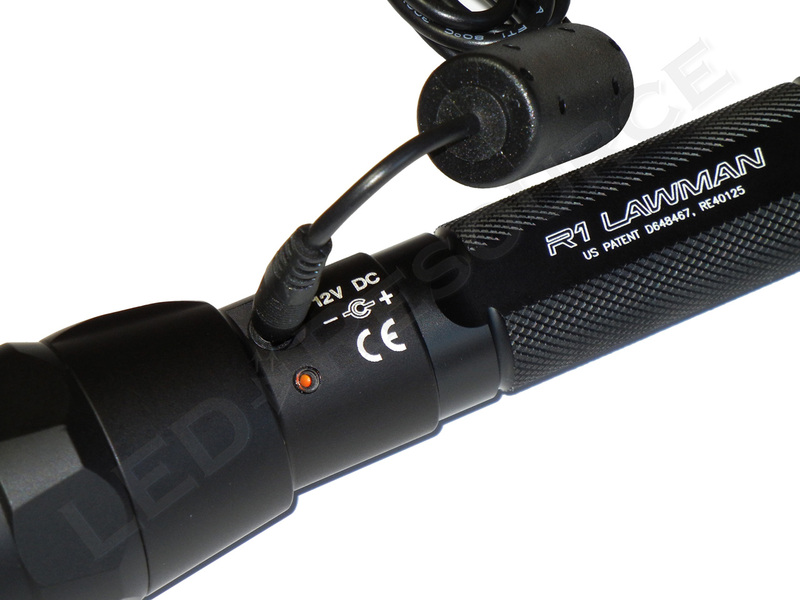 That being said, the R1 Lawman has introduced a new standard for rechargeable flashlights, leaving current models comparable only to the R1’s medium mode, so there’s definitely a cost associated with all of this new technology. There’s no doubt about the R1 Lawman when it comes to features and performance, but we can’t say the same about the pricing as we did with the P2X Fury. While the SureFire R1 Lawman could be the best rechargeable flashlight that money can buy, we’ll have to leave it up to your budget or equipment allowance. 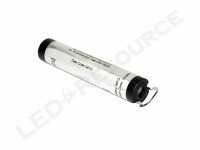 I purchased to use as a duty light. Regarding holsters, Tony from multiholsters.com makes a custom kydex holster for the R1. I got one with the Tek-Lok mount and it’s perfect for duty carry. 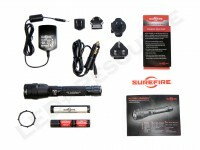 Regarding the blinking green light, did you hear back from Surefire? Mine does that too. Excellent review. I found it very helpful while researching the R1. Thanks for taking the time to post. I haven’t gotten a chance to follow-up on that, but I’m pretty sure that is just the new full charge indicator. following the simple instructions, I cannot get the strobe to function. Check that you’re in the correct function set with strobe. The default function set has it disabled. 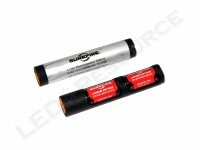 Would it be possible to open up the B10 battery pack and replace the 18650 battery? Spare batteries are not officially available for purchase, but if you have a problem with the original battery, it’s covered under warranty for two years. You could also try calling them and see if they will sell you a spare. As for the 1,000 lumen version, given that there is really no difference other than a more efficient LED, we are probably not going to re-review it. Almost everything in this review applies to the updated model. Bought the R1 Lawman 1000. After charging full, tail cap worked briefly and now won’t work at all. Light won’t come on when turning clockwise fully. Does the head switch work? Try removing and reseating the battery. Avoid leaving the light on the charger after it’s fully charged, as the Fuel Gauge LED can discharge the battery. 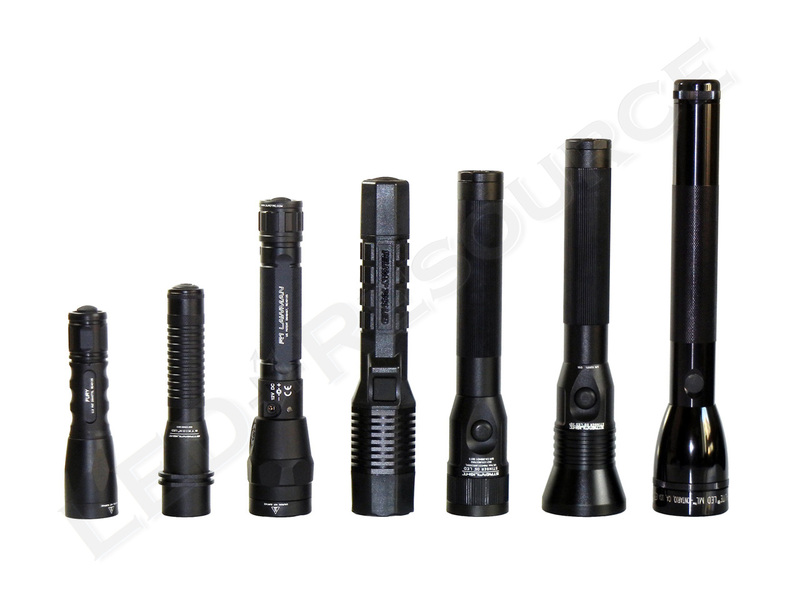 Give SureFire a call, this should be covered under the warranty. You will need to send the light back for repair.